As an incentive, Tinder promised to donate $10,000 to Project Cat for International Tiger Day in July. The site also gave users suggestions of how to show their appreciation for the environment by uploading photos with them planting a tree, volunteering at an animal shelter amongst other things. The moves comes after the charity PETA penned a letter to Tinder asking it to ban tiger selfies, arguing that the practice of ‘Tiger Selfies’ is not only cruel because they require tigers to be caged, tied down or drugged in order to take a photo, but also dangerous for humans who might risk snapping a selfie with the animal in hopes of impressing a potential match. Tiger selfies have long been popular on dating apps, yet data shows that these photos often don't resonate with swipers, as they are considered poor taste. The reality for tigers, lions, and other big cats who are featured in an alarming number of Tinder profile photos is that these animals are typically torn away from their distraught mothers when they’re just days old and then subjected to extreme stress and physical abuse. Most are housed in small concrete cages or barren enclosures with limited access to fresh water and are trained to be fearful and obedient. A recent report by World Animal Protection documented the suffering behind the tiger-selfie tourism industry. It found that in Thailand alone, there were 830 tigers in entertainment venues. 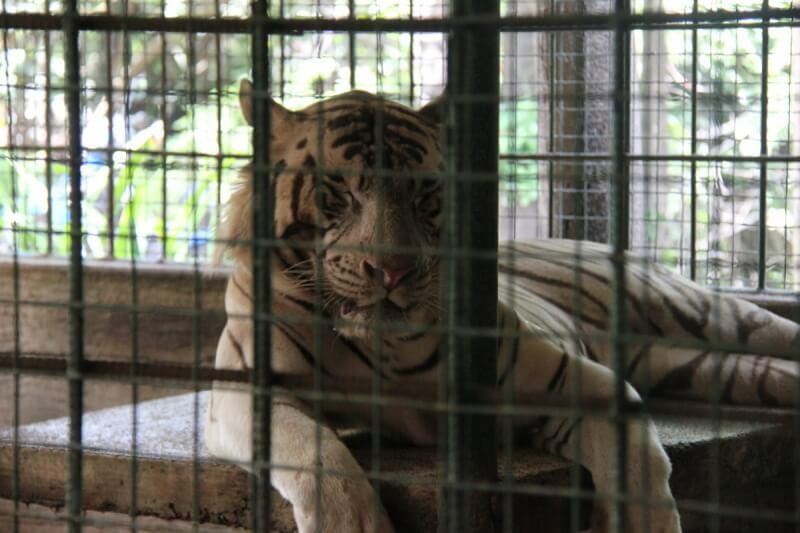 Once the tigers have grown larger and are too dangerous to handle, they end up being locked away in cages or heavily sedated. These types of photos cruel to animals. We’ve lost 96% of wild tigers in the last century. As a large predator, tigers are what is known as an umbrella species, where they play a key role in maintaining a healthy ecosystem. By protecting tigers and their habitat, we’re also helping to protect other at risk animals that share this habitat, like Asian elephants, greater one-horned rhinos, clouded leopards and important prey species. Since tigers need vast amounts of land to thrive, by protecting tigers also protects vital forests, which in turn benefits local communities, and the planet as a whole. Tigers already face multiple threats from poaching, habitat loss and fragmentation, conflict with humans and overhunting of their prey species without needing the added online threat of dating apps and selfies.